Street Parking allowed after 6:00pm, payment required until midnight. The closet public parking lot is located on 46th Street between Lexington Avenue and Third Avenue. We are located just steps away from Grand Central Station. Please contact us for your private event needs. 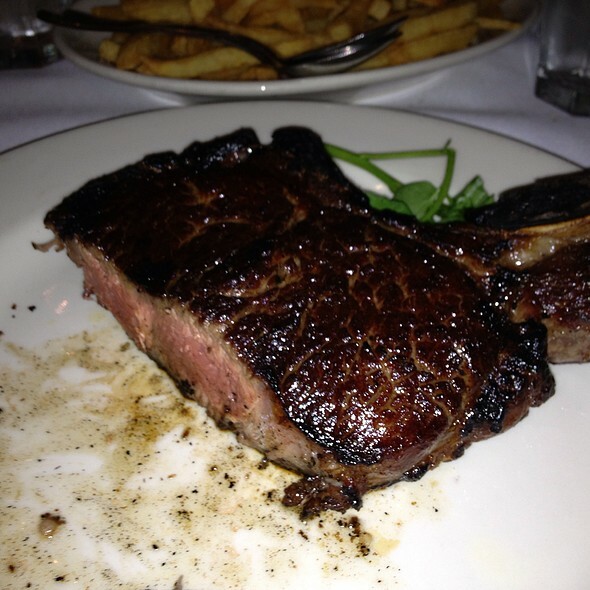 Located in New York's landmark Helmsley Building, Bobby Van's Steakhouse has been serving the best porterhouse in town for the last eleven years. Upon entering, one is greeted with the sight of a credenza groaning under the weight of large bottles of wine. A bar full of regular customers is on the left and looking into the one-hundred seat dining room, one sees the thirty foot high ceiling and windows overlooking Park Avenue. To complement our Prime Aged Steaks our Sommelier has created an award winning wine list. Whether you're looking for a big Cabernet, a Pinot Noir or something in between our comprehensive list is sure to please. " Little neck clams topped with seasoned bread crumbs. Little neck clams topped with onions, peppers and bacon. Whole steamed chix lobster searved chilled. Pan seared sesame crusted tuna served rare with a miso marin sauce. Iceberg Lettuce & Blue Cheese Dressing Topped with Bacon & Fried Onions. My $42 salmon was flavorless. My 2 dining companions said same of their lunch. The staff catered exceptional well to our our dinner experience. The on the bone filet veal parmigiana was cooked perfectly. This is an excellent staff, service and food. A pleasant dinning event. 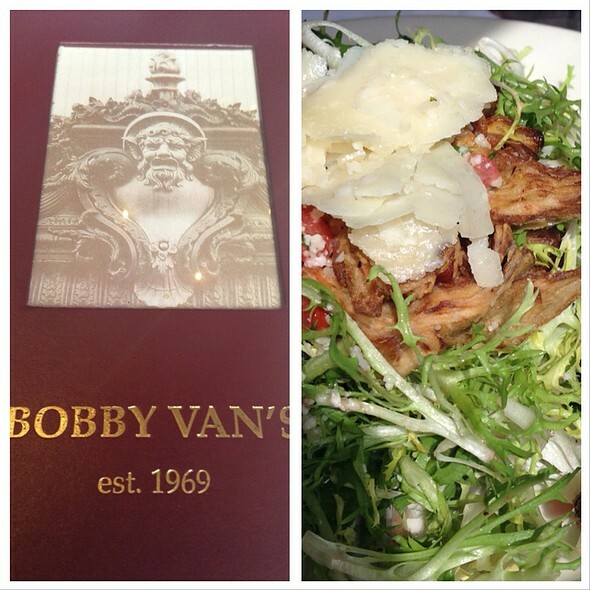 Bobby Van's , excellent fare and great atmosphere are synonymous. The staff is top notch. Excellent service. Never disappointing. Came here with my brother-in-law and his sons for his birthday--and we could not have been treated any better than on this evening. As we arrived early on Saturday evening, we had the pick of most of the tables and chose one by the windows looking out onto Park Avenue. 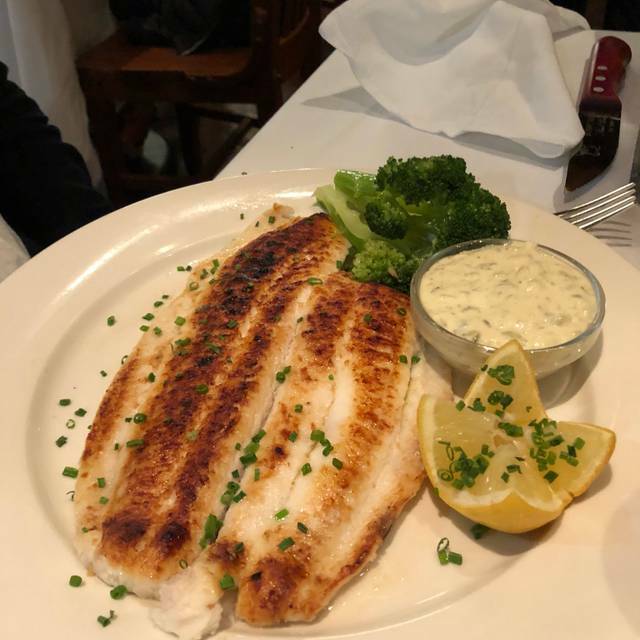 Getting here from the suburbs and outer boroughs is easy as Grand Central Terminal and the subways is within walking distance of the restaurant (parking is challenging and expensive). The waitstaff is professional and caring and saw to all our needs. 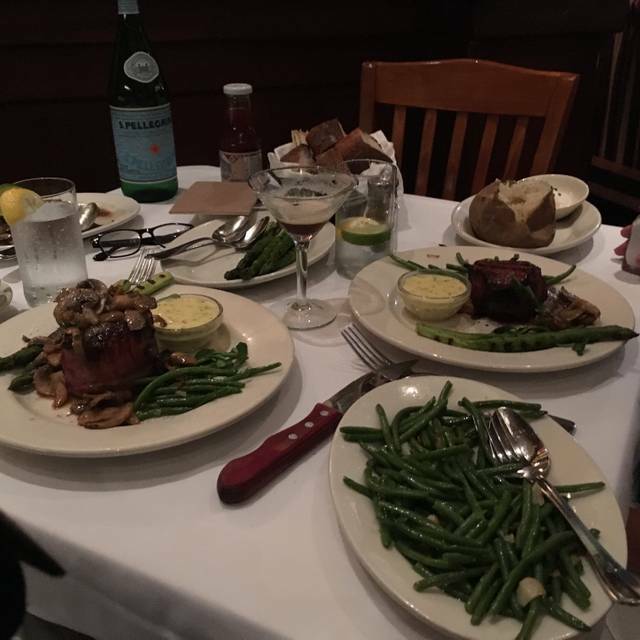 The menu is spectacular, with a variety of meats, seafood and sides; we chose the porterhouse for four with spinach and mashed potatoes and everyone was well fed at the end. This Bobby Van's Park Avenue knows how to take care of its customers! food was acceptable but overpriced for the overall experience. if I were still taking clients out and the conversation and the booze was the primary focus i'd be ok with the menu. but there was not the kind of menu I would expect of an upper echelon steak place. reliably top-shelf steak house food. Service is the best in NYC. Thoroughly enjoyed our dinner at Bobby Van’s. The food was delicious, and the service was great. And we were not rushed through our meal at all, rather we took our time and were able to chat over our wine before we ordered our dinner, without being interrupted. Always consistent! Great steak and s great salad. Appreciate that the staff is fairly seasoned and I know most of them. They take care of you! The food was fabulous! The Seafood Tower was one of the Best in the City! Steaks and Veal Chop were phenomenal, as were the sides! The service provided by our Server Mike Rushiti is one of the reasons I continue to frequent this establishment, with all the options in the City! Thank You! Simply the best food, best service, best people!!! The food is always outstanding, the service is impeccable and it is a superb restaurant. Highly recommend! So it is always consistent , great service and very solid food. Fish and beef all superb. Always an amazing dinner! Porterhouse for 2 was fabulous! Service exemplary ! No charm, bad service and food taste not good. Will never come back to this place! As always the food was on point and fantastic! Our servers Mike Rushiti and Dominick were phenomenal and the reason I keep going back! This Bobby Vans always delivers a great meal. There is nothing like ordering a steak with a side of chicken parmigiana. The best meal! The restaurant is very lively so if you are looking for a quiet place this is not for you. The service was OK (actually the folks responsible for food delivery, refilling the water etc. were spectacular - so perhaps it was just our waiter who was OK). I had the shrimp bisque soup, which was very tasty. I had the lamb entry with an asparagus side. The lamb was cooked perfectly to my taste. I'm not a fan of jellied mint, but their was sensational. I had to skip desert as the meal was filling. I will definitely be going back. Have the ribeye you won’t be disappointed! 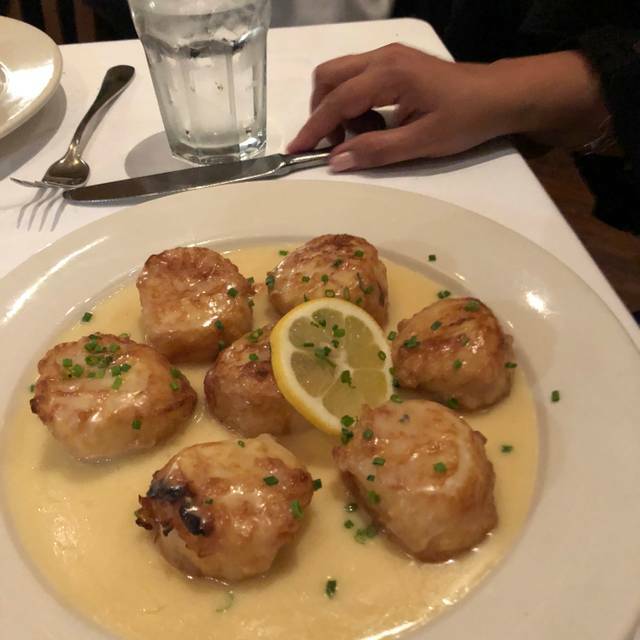 Chilean Sea bass was outstanding. 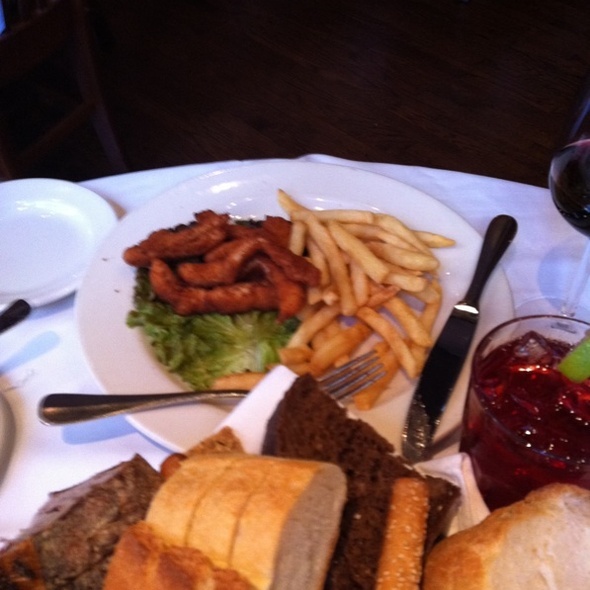 Food was excellent, service very attentive. The entire staff was professional and very pleasant. I had a filet mignon and my wife the chicken francaise. Both dishes were terrific. Thanks. Overbearing staff, limited healthy options, pushy coat room staff who snatched $10 out of my hand and pushed me out of the door. Solid as usual. Great dinner near Grand Central. Does the "Business Dinner" well. We had an awesome night celebrating my birthday. 2 kids and 2 adults. The staff was incredible and so was the food! Thank you BV! My expectations are always exceeded, no matter which Bobby Van's I dine in. That kind of consistency and quality across the brand is commendable. Service is always top-notch. The food will make you stop and say "thank you." Make sure the Matre'd gets your name, otherwise you may get a nastygram from OpenTable. 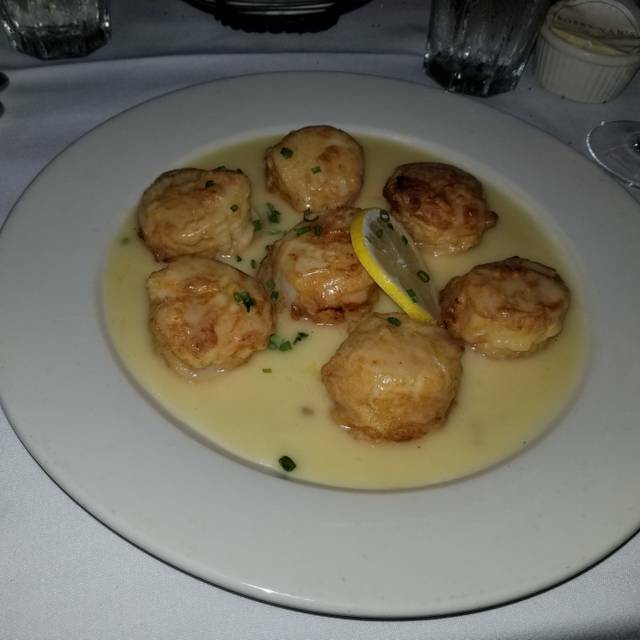 Bobby Van's is reliable for quality food, good service and a vibrant seems. Never disappoints. Food and service was excellent, as always. But I’m always a bit shocked when the bill arrives. Good place for business lunch with professional appearance and excellent location. Slow waitstaff but great food. Accommodates restrictive diet, pleasant and helpful staff. 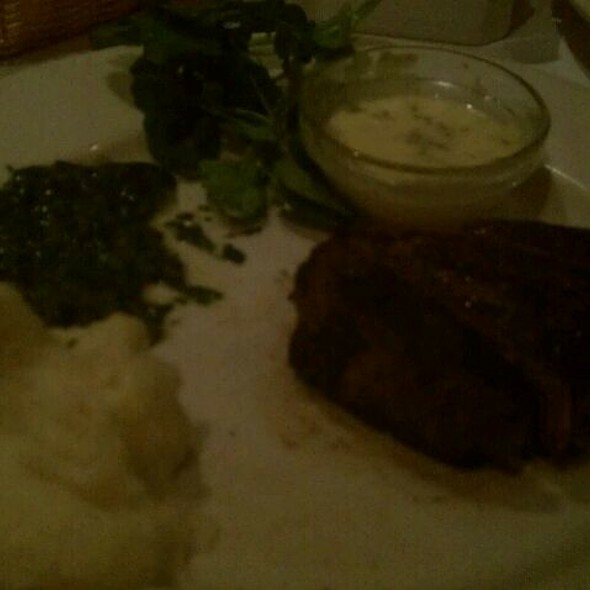 Great Porterhouse, creamed spinach, and potatoes! Everything else, the tomatoes, onions, dessert, etc. was nice, but come here for the steak! Wonderful service and midtown steakhouse atmosphere that was equally tasty and satisfying, though not quite the level you would expect at those prices. Food, service, and ambiance was outstanding. Everything was wonderful but you sat us next to the kitchen entrance and our waiter stood by us the entire evening. Move that table no one should ever have to sit there.